Remember Garbage Can-dy? You got a little plastic trash can that you could open, and it was stuffed with SweeTart-like candy that was in the shape of trash. Bones, fish skeletons, opened tin cans...all the stereotypical trash shapes. Like the person in the Flickr comments, I kept the trash can and used it in my dollhouse. And I also remember the Mr Bones version, a little plastic coffin with candy bones inside. Weirdly, it was invented by Maus cartoonist Art Spiegelman when he worked for Topps. Supposedly he also invented Wacky Packs and Garbage Pail Kids. I just found out that Art Spiegleman was the creator of this earlier in the week when I was reading up on Maus just for kicks. 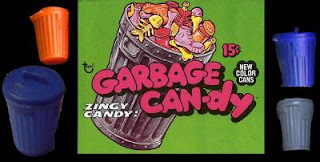 I do remember that candy, as well as the Wacky Packs and Garbage Pail kids.